Even if you’re not going to Lisbon you could read this blog post to have a sneaky peek into Lisbon and Cascais. It’s the perfect and affordable European city break to go to with some friends and/or family. If you’re staying in Lisbon but fancy a trip to the beach I would recommend getting an uber from Lisbon to Cascai. It’s a super cute and quaint sea side town with some amazing restaurants, bars, and beaches. The uber is about a 20 minutes ride away and cheaper than taxi’s. For the beach itself you can hire a bike and cycle 40 minutes or get an Uber to Guincho beach! It’s also named the surfers beach – it’s a great spot to sit and watch the surfers! 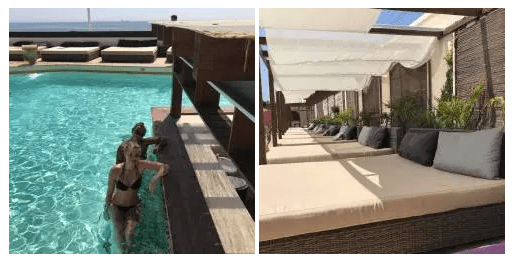 If you fancy a day at the pool I would recommend the reverse pool lounge in Cascais. They do delicious cocktails brought to you in your day bed at an affordable cost. The day bed cost’s 20 euros a day and the cocktails are around 8 euros. You can find all the costs and any more details linked on their website. If you fancy some culture and the feeling of what it’s like to be a princess for the day I would recommend getting an Uber to Sintra and visiting the main castle Pena. The castle is simply beautiful and like something out of a Disney film as my mum and dad quoted. I felt like a princess wandering around the gorgeous castle and gardens that surrounded it. I would recommend giving yourself a day here to wander around Pena and the other surrounding castles/gardens. Bring a picnic too if possible as this is a tourist spot and food can be quite pricey. PS –Sintra is at the top of a mountain so it’s a bit chilly – wear trainers and a jumper! Montserrat is also a beautiful castle in Sinatra with stunning gardens and fairytale vibes! If you are interested in wandering around some beautiful gardens and snapping up those beautiful Instagrams I would recommend that you go to Quinta Da Regaleira. There’s a gorgeous house that you can wander round as well as the most magical gardens with waterfalls, caves and wells that you can explore into. For shopping I would recommend that you check out the LXFactory. The LXFactory is a revamped industrial estate. The shops used to be factories and warehouses which now house quaint fashion shops, coffee shops, a book shop, wine and sardines shop and much more. For brunch I couldn’t recommend Nicolau to you enough. The food and coffee’s and smoothies were delicious. I dragged my parents along here for brunch before we headed off to the airport and we all had the most delicious meals. They do gluten free, vegan and vegetarian offers for breakfast and you can have anything from an Acai bowl to Nutella on pancakes for breakfast. For dinner, I would highly recommend that you check out Time Out in Lisbon. Time Out has a range of different food stalls offering different foods from seafood to pizza to custard tarts. I went with my parents to Monte Mar and had a range of seafood dishes. Monte Mar was personally my favourite food stall there and the chef’s were so friendly! They even gave us free squid rice which was to die for! For cocktails, I would recommend Deck 7. The cocktails are delicious and affordable at around 8 euros a drink. The views are amazing too, the above picture was taken looking over at castle San Jorge which is another location I would recommend to travel too although Pena is much prettier with more to see. Another great place for cocktails with a spectacular view over the city is the Park Bar. This is a rooftop cocktail bar which is located on top of a car park in central Lisbon! This place was recommended to me by a local. Park Bar has chilled out vibes, good music, friendly staff and affordable drinks. I really hope that this blog post helped anyone thinking of going to Portugal or Lisbon! See you guys next Sunday at 6 pm! PS – Check out my vlog from Portugal to see more!